Register now for latest updates & promotions..
Vismaad has pioneered to bring Sikh History and culture through animated movies since 2005. Inspirational characters come to life in charming animation. Music has been the hallmark of Vismaad animated movies and is loved by everyone. Heroic Vaars, uniquely rendered folk songs and soothing Gurbani Shabads from all movies touch our inner chords and leave us teary eyed. Through this animated movie we have attempted to relive the beyond compare martyrdom of Baba Zorawar Singh ji and Baba Fateh Singh ji. Banda Singh ji was a true Khalsa and remained a steadfast gursikh till his last breath. His unflinching faith and love for Sikhi was above everything. Story of Subeg Singh & Shahbaz Singh is a unique page from Sikh History. This Father-Son duo is inspiration for Sikh Parents and Children alike. 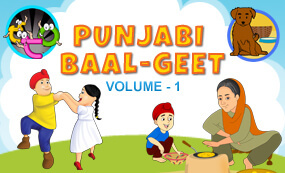 Sikhville brings funny Punjabi poems and short Punjabi songs for babies to simplify learning the Punjabi language..
SikhDVD.com maintains sufficient stocks in its stores to service all online orders in timely manner. Under normal circumstances your order is shipped within 2 working days from date of receipt of online order and payment in full. The shipping agencies normally take 7-10 days from date of shipment to deliver goods at all major locations in US, Canada, Europe, South East Asia and Australia. 90% of our previous shipments reached all destinations within 10-12 dates. SikhDVD.com (owned by Vismaad Pte Ltd, Singapore) will refund any products purchased from us as long as the product has not been opened or used and the product is returned to us within 14 days. The 14 day period begins from the date of product purchased online our website. If SikhDVD.com (owned by Vismaad Pte Ltd, Singapore) has made a mistake then we will also refund to you the postage and packaging costs that you have incurred (on both the initial order and the cost of sending the products back to us). We respect customer rights by following Distance Selling Regulations as formulated by UK Office of Fair Trading. These regulations give you the right to cancel orders with any online store within 7 working days of placing the order. For more information about the Distance Selling Regulations please refer to the UK Office of Fair Trading website. What an excellent job done by you for the young generation. Thank you so much for your wonderful resources. We are using these lessons in our classrooms at Khalsa School Calgary. New exciting games for Punjabi Shabadkosh - These games are great!